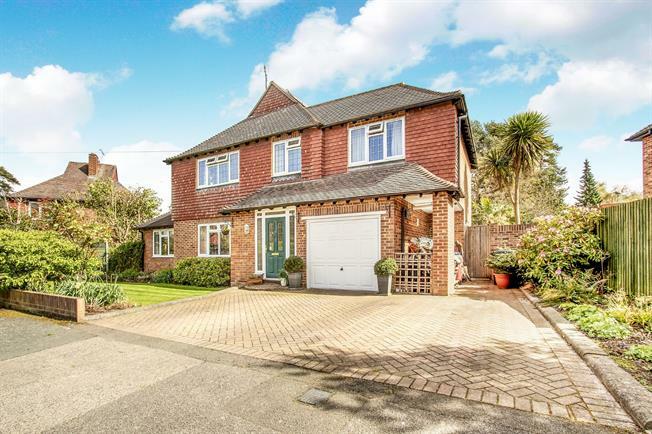 4 Bedroom Detached House For Sale in Woking for Guide Price £850,000. A well presented and extended four bedroom, five reception room detached home designed with family living in mind. Located within a popular residential road within Pyrford the property benefits from local shops (to the end of Lovelace Drive) and access to Pyrford Common. This property has a very pretty well-maintained front garden in addition to a generous double driveway and a secure garage. The property has also been extended both sides to include a master bedroom (including fitted wardrobes) with en-suite shower facilities whilst on the other side of the house (on the ground floor) two further reception rooms have been added. In the kitchen the current owners have refurbished to a high standard with use of granite worktops and a through utility area/cloak room. From both the conservatory and the utility area there is access direct to the lawned garden with decking/planted beds/sleeper borders. From the dining room the conservatory is accessible giving an all year round views/access to the garden. Features to mention include under floor heating in the en-suite bathroom, data cables in the lounge, play room and master bedroom (two are spare running into the loft for future use) and full LED lighting throughout except in the office where there are two fluorescent strip lights. There is also full gas central heating (energy efficient boiler installed 2015), a log burner in the lounge, solar panels and double glazing. Ideally located between West Byfleet and Woking there is the option of either mainline railway stations, both offering direct line services into London Waterloo. For families the local Pyrford junior school (with an outstanding OFSTED rating in 2013) is within catchment.